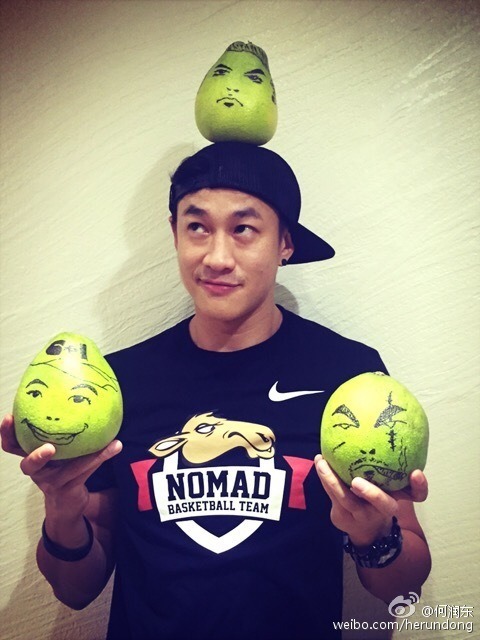 During this past round-up, our favorite celebrities celebrated the Mid-Autumn Festival (aka the Moon Festival) and got up to some other shenanigans. Kicking us off is Tang Yan and her picture-perfect moon cake. She’s currently filming the movie Bounty Hunter (赏金猎人) and will follow that up with the drama The Princess Weiyoung (锦绣未央). As always, keeping busy. What flavor [of moon cake] did you all eat today? If sharing a moon cake with Tang Yan is not your cup of tea, then there’s always Yang Yang! 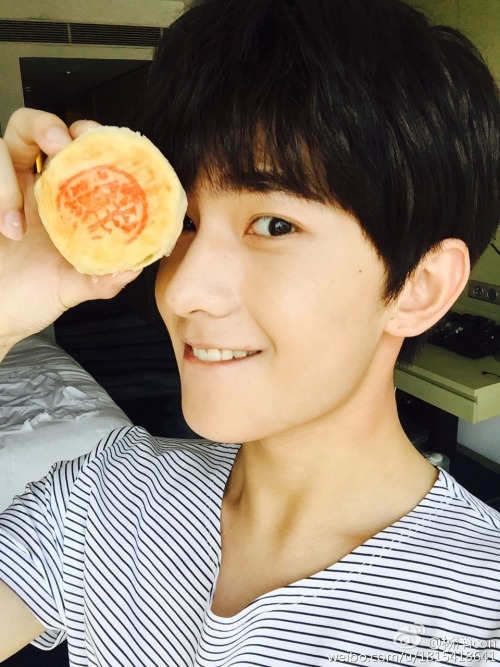 Catch him opposite Zheng Shuang next year in the drama Wei Wei Yi Xiao Hen Qing Cheng (微微一笑很倾城), which is looking super adorable based on the stills. And if moon cakes just aren’t your thing at all, then you can always take one of Peter Ho‘s pomelos and wear it on your head! Looks like he has lots to spare, after all. Using a bow and arrow to shoot an apple is already out, so these two days, shoot pomelos! A Mid-Autumn riddle, guess which of my upcoming characters I’ve drawn on these pomelos. 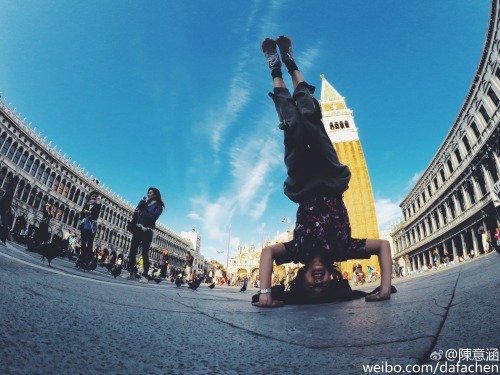 Ivy Chen visited Venice and did her trademark handstand-while-vacationing. 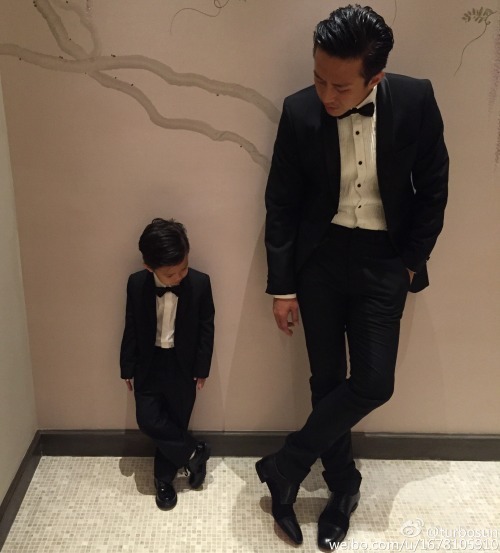 Sun Li celebrated her 33rd birthday on September 26, but she couldn’t decide whether to spend it with husband Deng Chao or son Deng Dengdeng. Her newest project, the drama Legend of Miyue (芈月传), is scheduled to air on November 30 on Dragon TV. She’s also starring alongside her husband in Devil and Angel (恶棍天使), a comedy film that will be released on Christmas Eve. Today is mjy birthday. They both want to go on a date with me. Whom should I choose? Ni Ni, who was one of the beautiful bridesmaids at Huang Xiaoming and Angelababy‘s wedding earlier this month, also recently became a spokesperson for Uniqlo. How does she make their simple clothing style look so good? Magic for all. Come and play. 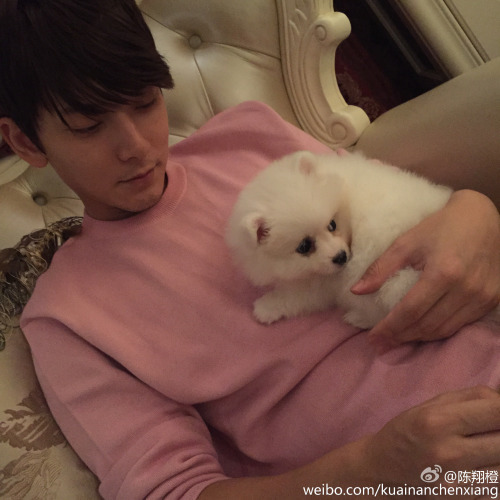 Chen Xiang introduced his new puppy and a silly joke that makes him all the more endearing. Introducing everyone to the new master in the home, “Wu Zai.” I originally wanted to call him “Mr. Perfect” but I was afraid that when people called him, I would turn my head in response. How embarrassing would that be? Y’all remember when Jimmy Lin announced two months ago that he and his wife were expecting another baby? Well, make that two babies. Yes, Kimi Lin is going to be a big brother to twin boys. Going to tell everyone some happy news: in the future, Kimi is going to have to take care of two little brothers! In the future, we’ll be a family of five! This entry was posted in Miscellaneous and tagged Chen Xiang, Deng Chao, Deng Dengdeng, Ivy Chen, Jimmy Lin, Kelly Chen, Kimi Lin, Ni Ni, Peter Ho, Sun Li, Tang Yan, Weibo Wednesday, Yang Yang by Jo. Bookmark the permalink. Jo is the resident Huang Xiaoming expert (a kinder way of saying "obsessive fan"). She's been watching cdramas since she was a little kid and defends her obsession with Chinese entertainment by saying it helps her practice her Mandarin. So cute. Love weibo Wednesdays!